HamMultiPlayer can use 3 monitors. - A window opens and display your active monitors. - Select in ComboBox the display you want to change. Note : Your monitors must be activated in Windows. - You must be using HamMultiPlayer version > 0.108 to use these options. This first example shows a dual monitor usage. You can choose if second monitor will display Thumbnails or Viewer. - Select Thumbnails in the ComboBox Menu. Monitor 2 is used to display thumbnails. (Viewer is displayed inside interface). (Move your mouse over thumbnails to change preview position). - Select Viewer in the ComboBox Menu. 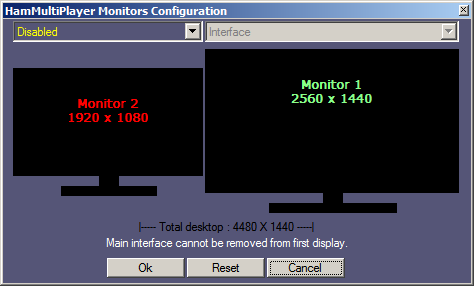 Monitor 2 will be used to display Viewer. (Thumbnails are displayed inside interface). Example with Viewer + Thumbnails display. 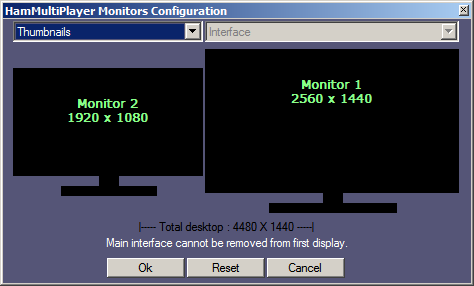 Monitors modes can be changed at any time.